Last week, quite unexpectedly, a lifetime's dream of mine came true. 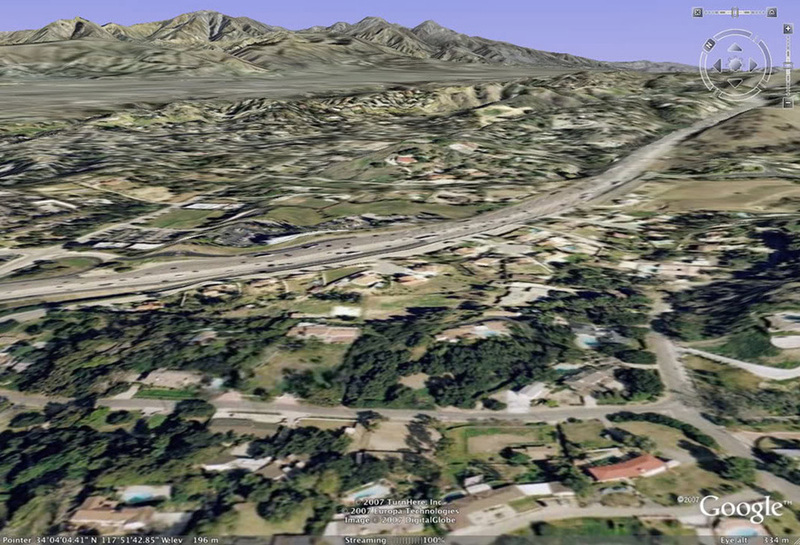 I've finally been able to see what the Covina hills I lived in as a child originally looked like before they became part of Los Angeles's spreading metastasis. See that outcrop of white limestone on the hill in the background? That's what we kids called the "Chalk Mine." Down and to the right from the chalk mine can be seen a much smaller patch of white. In 1959, my family's house would be built just to the left of that. 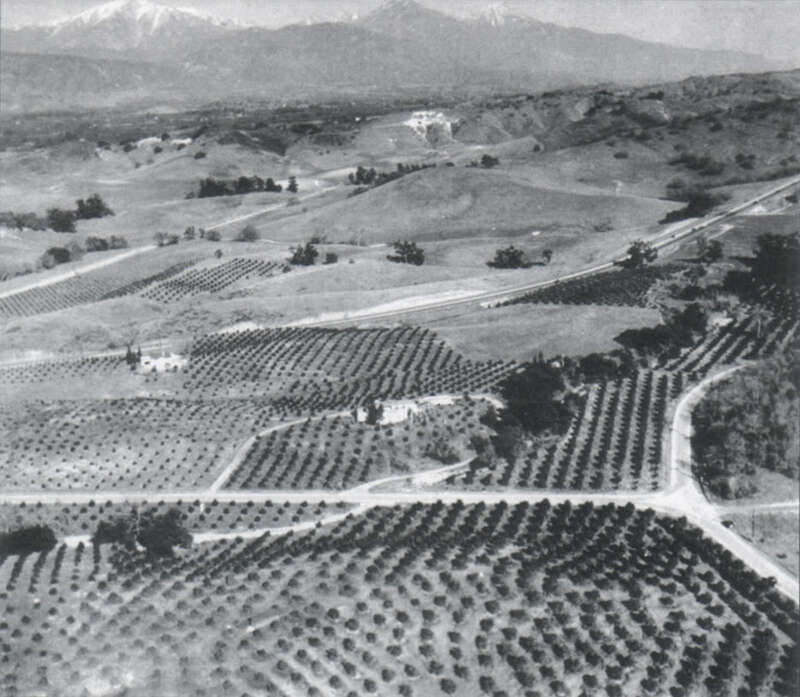 So these were my hills, circa 1935, about 20 years before I was born. I'm just totally blown away by this image. The whole little valley I lived in – and everything around it – was entirely undeveloped, open rangeland. Nothing but wild grasses, chaparral, valley oaks and orange groves. It is a vision of Heaven to me... a true Paradise Lost. And here is the same scene today, courtesy of Google Earth. The then-newly-constructed Arroyo Avenue (U.S. Hwy. 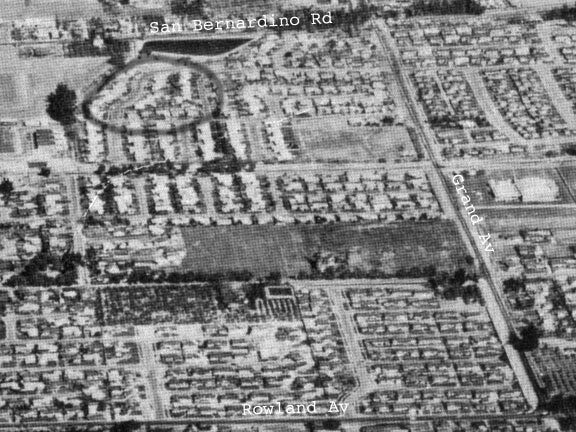 99) in the old photo is now Interstate 10, and virtually all the formerly open spaces are now occupied by homes and businesses. It's become just another faceless L.A. suburb. I'm grateful that I lived long enough to be able to see my hills the way they originally were. The chalk mine is long gone, but there's still a small refugium of undeveloped hills just past where my house was. Bulldozers may not have claimed it yet, but no coyotes howl, no jackrabbits scurry, no pheasants fly, no tarantulas crawl there anymore, like they did when I was little. It's all dead land now, fit only for humans. My old medicine bottle collection – which I started 25 years ago – is now complete. I finally have a Covina bottle. I found my Holy Grail at last. Now there's nothing more that I'm looking for. There's no way I could surpass this find, anyway. 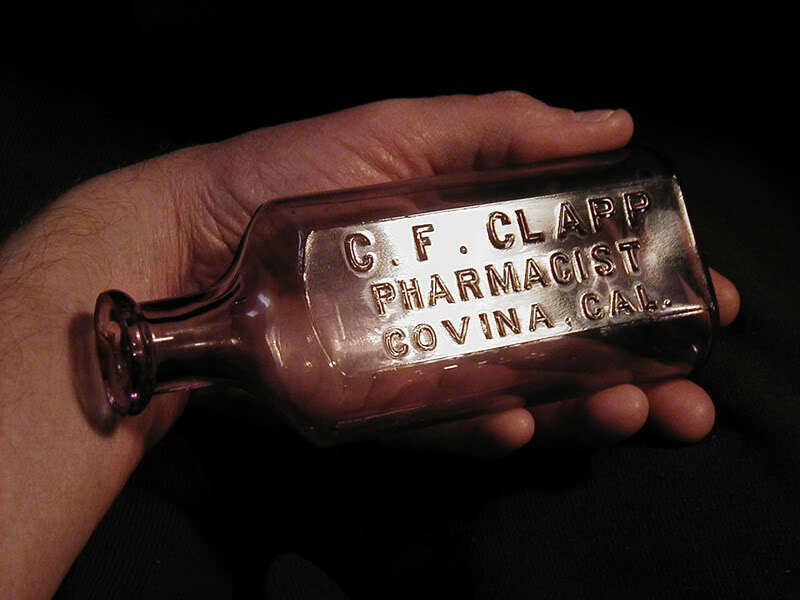 According to the seller, this bottle lay in a surface dump in Covina for about 50 years before I was born there, and 50 more years later, it is mine. The aerial photo below was taken in 1957. The charcoal-circled area near the top was the approximate location of the dump, behind the old city reservoir on San Bernardino Rd. That's where its original collector found it, right around the time I entered the world. I got the bottle on eBay for only $66. After I won it, I asked the seller what its book value was. He said it had no book value because not enough examples of it are known to exist, so the price I paid is unbelievably cheap. I'm still amazed that there wasn't more interest in the auction (there's a highly-predatory cabal of Covina collectors on eBay, who obviously have a lot more money to throw around than I do). Anyway, a similar medicine from nearby Alhambra from the same seller went for $230, so I really was quite fortunate in this acquisition.